Setting off from Dushambe in the intense heat of the low plains of Central Asia. Can’t do any cycling between 11am and 4pm. 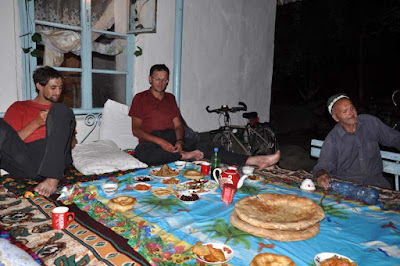 Add to this the lack of training, some rough roads, a few landslides, a 3250m pass, numerous stops to admire the scenery or take photos, and bowels that have decided to take some liberties, the first few stages were rather short : 12 days to reach Khorog some 550km away... If I keep that rhythm, 6 months won’t be enough to cover the planned distance, I’ll need at least 12! Pierre (travelled with him last summer), Celine (friendly French Canadian girl who’s on a similar itinerary : http://freewheelinghimalaya.blogspot.com) and Ricky (friendly bloke from New Zealand crazyguyonabike). Sage who started with us is now going her own way towards Kyrgyzstan. In the evening, if there is no hotel, there’s always a family inviting us to spend the night and share a meal. It’s the first cycling trip in which I’ve got such a sense of hospitality. Our relationships with people don’t seem to be based on money, this is so different from other more touristy countries. It’s so pleasant. The landscapes outside Dushanbe aren’t spectacular, but we quickly reach beautiful gorges. The climb to the first pass reminds me of the passes in the Alps with pastures and some snow-covered peaks in the background. As the road is blocked because of a broken bridge, there’s very little traffic. Fortunately, there’s (almost) no pb to cross it with the bikes, thanks to the local workers who give us a hand. Then we reach the Pjang river marking the border with Afghanistan which we’re going to follow for 250km. Some tarmac at last! A few tank wrecks can be seen by the side of the road, reminders of the past wars. The Afghan side is dotted with small villages. All this seems a bit strange. We are on a real road, in a country which is of course less developed than back home but where people have access to water, electricity, mobile phones and some sort of comfort. Just on the opposite side, a few dozens meters away, are entirely isolated villages with no proper roads linking them to the rest of Afghanistan, adobe houses. People walk or ride donkeys from one village to the next, waving at us, even sometimes inviting us for a chai. How the hell do they want us to swim across?!? It’s both very close and very far. On the Tajik side lie what must have been trenches during the war with small towers overlooking the river. The army is still very much present. I wonder how the conflict could possibly spread all the way here. The Afghan villages are cut from the rest of the country by high mountains. On the river banks, a tiny mountainside path sometimes fades away in rockslides. We eventually reach the small border town of Khorog. At an altitude of 2000m, it is cooler. I’m taking a couple of rest day in a comfortable guesthouse. Shower, bike maintenance, internet. Back on the saddle (so to speak) tomorrow, going to Ishkashim, visa in hand to go trekking and cycling for a couple of weeks in the Afghan Wakhan. Then back to Tajikistan, heading towards the Pamirs and Southern Kyrgyzstan, only route to China open to foreigners. No internet before reaching Kashgar in China, probably late August. No news till then.